The portable marble drilling machine, with or without suction lifters, for glass and marble is a suitable working instrument for stonemasons and glaziers. Can be also used in constuction-site and during installation processes. Stainless steel made (base and “Chuck” bit support), moves the drilling group by a mechanical gear for a correct rise and lowering of the drilling block. 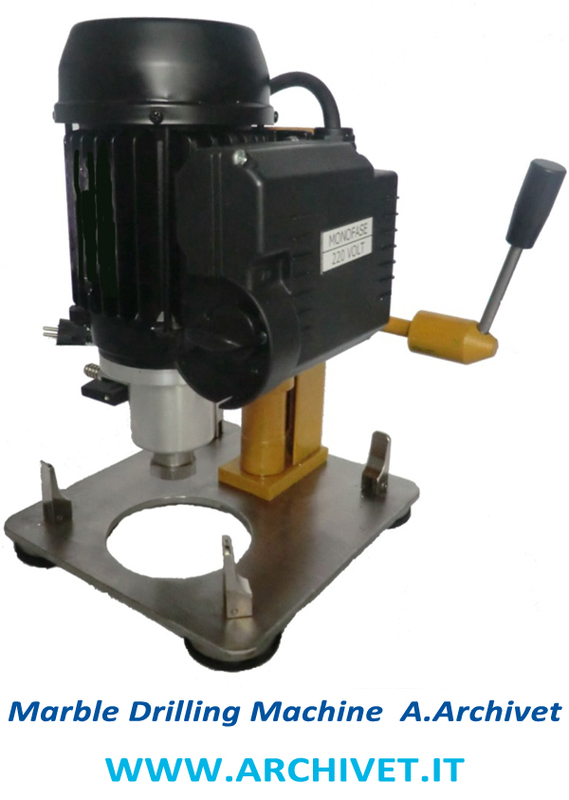 This drilling machine is activated by a mono phase engine, double speed ,1400 / 2800 rpm. The machine uses ½ inch “Gas” drill bits up to 100 mm, with direct water lubrication. The marble drilling machine, from today is now also available with a separate additional water tank.